First manufactured in 1955 the Colt Python is back from the dead! You already love the long barrel version, but now you can take this 2.5” barrel wheel-gun for a spin. Featuring single and double action trigger, this snub-nosed Python gives you a realistic feel when squeezing off .177 BBs or Pellets. A shooting lover’s dream, this air pistol includes 4 magazines: 2 10rd pellet mags and 2 10rd BB mags so you can shoot more and reload less! Speaking of reloading, we’ve included 1500 UX BBs, 500 RWS Pellets, and 12 CO2 cartridges so you’re range ready right out of the box (which includes a Plano Hardcase for safe storage). 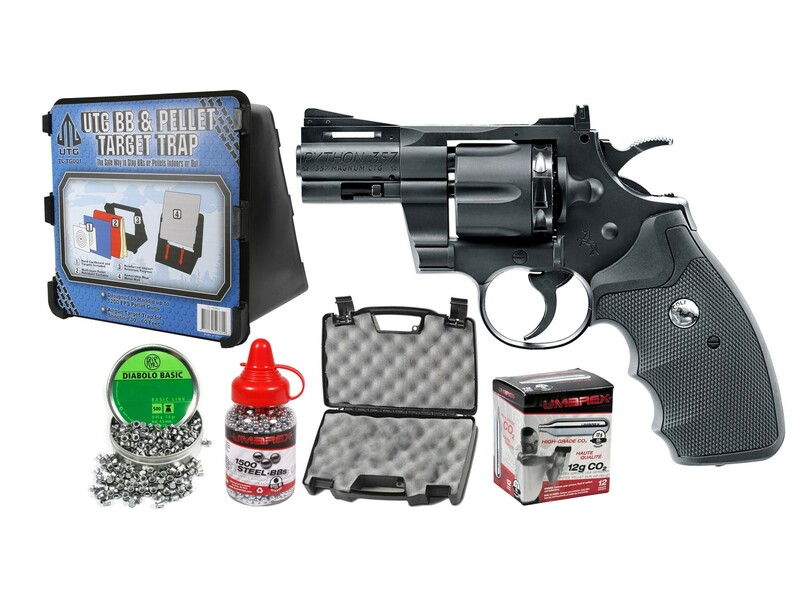 This Python kit is so range ready, we’ve even thrown in the ideal basement target--a LE-UTG BB & Pellet trap! 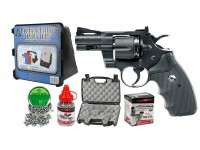 This kit has everything you could possibly need for hours of shooting your CO2 Python, and at this price it won't put the "squeeze" on your wallet! Things I liked: Purchased as a gift, she loves it. Shoots inside during winter months with included pellet trap. Very accurate out of the box. Things I would have changed: Wish it had more heft, but good quality for the money.